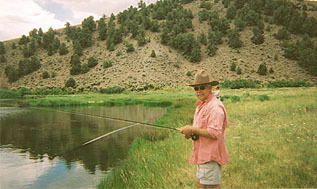 Nestled in a small valley, about 100 miles southeast of Fallon, Nevada, there lies SMITH CREEK RANCH and one perfect little six acre pond that has some of the biggest, fightingest rainbows, browns, and lahontan cutthroat strains that I have ever seen. The strains are developing length till they get to fifteen inches and then they develop girth. You think I jest, but I have pictures to back up my words and people willing to stand up and be counted. Bobbie Armor caught the biggest fish on our three-day adventure over the fourth of july, an eight pounder. Rich Holubek and Rich Catanzaro caught large fish too. We arrived several hours apart on Tuesday, the third of july. Bobbie and I had fished in the morning, had lunch, and were getting ready for an afternoon on the pond, when the Riches showed up. Unpacking was left to later as we showed them the layoug and got their rods ready for action. Bobbie was out in the float tube, casting to swirling fish taking blue damsel adults off the surface. I caught five and then stopped counting. 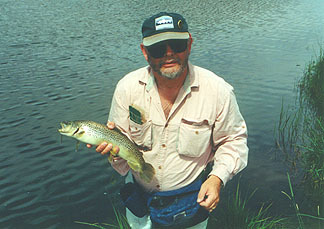 The ranch raises their trout from egg to about three pounds, when they are placed in the pond. Some females are held back for breeding future stock. Wednesday the fourth came clear and warm, only to have thundeerstorms cloud up during the afternoon. People on the pond in belly boats got drenched before they could get off with a pelting rain. Still the fishing was fantastic. The fish are not shy by any stretch of the imagination. They can for blue damsels, Madam X's, dragon flies nymphs, any hopper pattern from small to large. The fish were aggressive and not leader shy in the least. The water temperature in the pond is kept at 50 degrees over most of the day. There were times in the night that I thought I could hear fish slapping the surface in their quest for food. Thursday dawned as nice as the rest of days since arriving. We fished from nine to almost twelve thirty. The Riches and Bobbie were again in float tubes working around the island in the middle of the pond, catching fish everywhere. 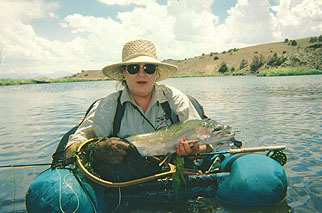 As Bobbie was coming out of the water, trolling her fly across the pond her rod dipped and then line peeled off the spool. The cry was heard loud and clear, "FISH ON". Only different in that it pulled her around the pond and ran line off into her backing. This was done several times before she was able to net the fish and Rich C. took a couple of pictures before the fish broke off and was pulled from the weeds along the edge of the pond to be revived before being released healthy. It was 28 inches long and weighed in excess of eight pounds. Unfortunately, we were forced to stay off the water in the afternoon. by a gully washer and decided to head for home. During the drive out to the highway we encountered rain, sheets of it, wind, and worst of all, hail about the size of golf balls. As we crossed the pass to hwy 50 there was snow in under the sagebrush waiting for warmer temperatures to melt it into the dust. Everyone had a good time.